We really hope you think the idea of a science-focused community, digital platform and podcast is something you’d like to support and get involved with. And we do need your support to keep creating the podcast, and seeking out innovation, inspiration, and the ‘ordinary extraordinary’ stories told by people in our community involved in science every day. We are not sponsored in any way, which has some very powerful positives (we can be independent) but it does mean we need to harness the power of the Internet, and our community, to make it all happen. We’ve thought long and hard about this. And there are two main ways you can contribute and get involved. The first is via our Patreon platform. Patreon is a website that allows you to subscribe different regular amounts, and receive awesome rewards (well, our undying thanks for starters) in return for your subscription. We’ve set up a page that tells you all about it – and there’s even a video explaining how the whole set-up works. There are three supporter ‘level’: Science Supporter, Science Connector and Science Energiser. Each has different levels of commitment – and different rewards from the community. Take a look and see which level is right for you. Patreon is a US-hosted website, so prices are in $. To give you an idea (in March 2018) a $7 commitment works out at about £5. We also appreciate that some people will want an alternative means of supporting the podcast, and so we have set up a Paypal.me page. This isn’t as flexible as Patreon, but does give an alternative and allows you to subscribe to the podcast at whichever level (Science Supporter, Science Connector and Science Energiser) for six months – click on a link and follow the instructions. Now, if you look at both of these options and think – I’d rather do something else to support you, that’s OK too! Please email us at science@storiesfromscience.co.uk and make a suggestion – we’re exploring ways to make this work just like you. And if you’d like the Stories from Science team to create something for you (e.g. a dedicated podcast in your workplace) then definitely get in touch. We want to great creative and innovative with the format, so let us know how we can help. 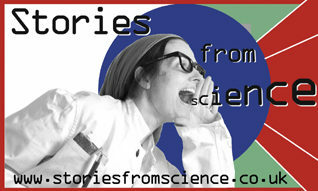 Thanks so much for considering supporting Stories from Science. We really want to amazing things with both the podcast and the platform. With your help – we’ll get there.